This iconic bay is a highlight for many in Hawaii. Your guide will talk about the geologic formation of the bay. 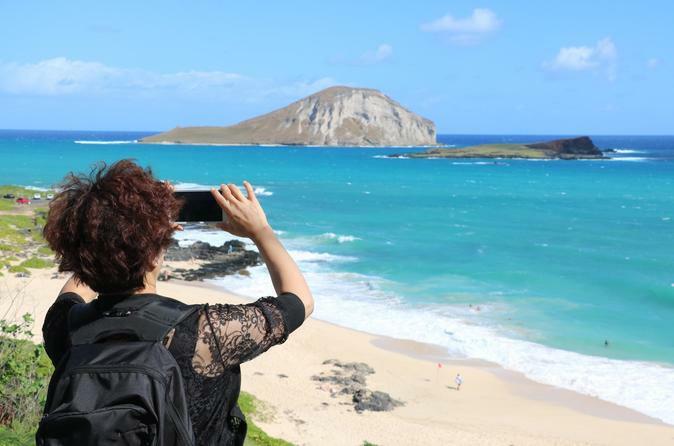 Your group will have an opportunity to take pictures of the bay and stroll the grassy park area at the top of Hanauma Bay. At the Halona Blowhole (meaning peering place or place to lookout), water can shoot up to 30 feet into the air. The reason the water shoots into the air here is due to small caves along the coast with an opening at the top. During the winter we may view whales along the coast. On a clear day we can see Lanai, Maui and Kahoolawe. Here at the Macadamia nut farm, guests will be able to crack open a Macadamia nut to sample the raw nut. There are also Macadamia nut samples, a gift shop, and Kona coffee samples. Breathtakingly beautiful ranch on the windward side of Oahu. The ranch consists of three valleys: Kaʻaʻawa Valley, Kualoa Valley, and Hakipu’u Valley. Guests will have time to see the petting zoo, take pictures of the beautiful ranch and visit the gift shop. More than 50 movies and TV shows have been filmed at Kualoa over the years, since the 1966 Elvis Presley film Paradise, Hawaiian Style. Kualoa has also been a film location for Jurassic Park, Jurassic World, 50 First Dates, You, Me and Dupree, Hawaii Five-0, Mighty Joe Young, Pearl Harbor, Windtalkers, Godzilla, and Lost. This stop allows you to try the famous shrimp of Kahuku in a plate lunch. Sunset Beach is a great place to watch the surfers in the winter. It is known for beautiful sunsets and nice sand. Guests spend time shopping, getting shave ice, and enjoying local food in this old plantation town. Spend some time at the famous Matsumoto’s Shaved ice for an island classic: Shave Ice. At the Dole Pineapple Plantation you will see what a pineapple plant looks like, how to cut a pineapple, and how chocolate is grown and harvested. Learn about the famous dole family and enjoy the famous Dole Whip treat.